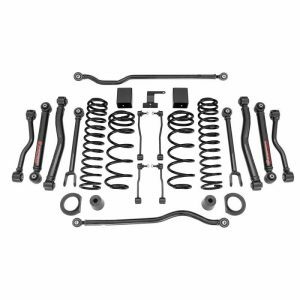 The Standard 3.5 Suspension System provides 3.5″ of lift for your TJ or LJ at an economical price. 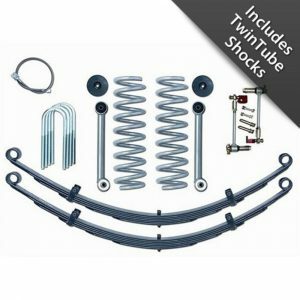 This suspension system is ideal for an entry-level vehicle owner or those on a smaller budget. 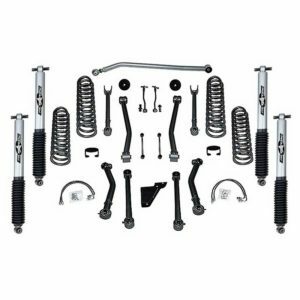 This standard lift system features new coil springs, bump stops and extended sway bar end links. The stock control arms, track bar and other components are retained. This system will perform smoothly on and off the trail, and is easily upgradeable to either a 3.5″ or 4.5″ Super-Flex System. The Super-Flex 3.5″ System is the ultimate suspension system for TJs and LJs currently running the factory short arm suspension geometry. 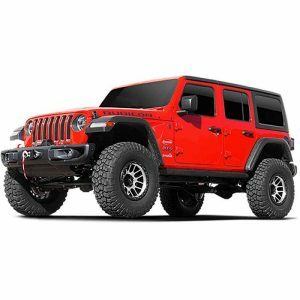 The Super-Flex 3.5″ System is a complete suspension system, featuring 8 new control arms, adjustable upper front and rear with our serviceable Super-Flex spherical ball joints, adjustable front track bar, replacement 4.5″ lift springs, extended bump stops, longer front stainless steel brake lines and Gen II sway bar disconnects. The Super-Flex Suspension System combines superior flexibility and handling. 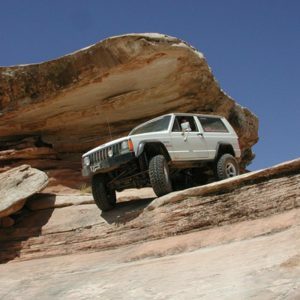 Installing one will give your Jeep the on and off-road performance you’ve been waiting for.